Last edited by fanguy; 12-21-2016 at 05:17 PM. Last edited by fanguy; 12-21-2016 at 05:33 PM. Why not just join the PCA? Our local chapter is full of great guys and for only $50/year you also get the Magazine and lots and lots of socials and fun runs. Thanks for asking, I do belong to PCA Reg 5 Warbonnet Chapter. I have run into other owners' who don’t want to join the cooperate thing. 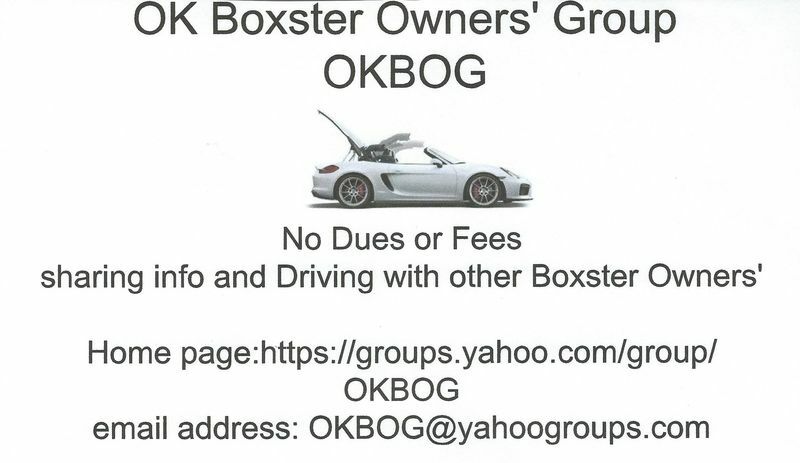 If you Live in OK or bordering state and would like to go on drive with other Boxster and owners’, please check us out. I'm not as interested in group rides but would like to meet others to swap parts and help each other out. Just bought a Boxster last week. Noticed we don't have a Facebook parts group so I created "Oklahoma Porsche and Porsche Parts".